For most of the students at Gary Comer College Prep, a charter school on Chicago’s South Side, a trip outside of city limits is rare -- let lone a trip out of the state. So when a group from Gary Comer was one of 15 out of 1,500 teams of student filmmakers selected to premiere a clip at the White House Student Film Festival March 20 and meet with President Barack Obama, it was big news. The students’ entry was a hip-hop music video highlighting the school’s unique C.H.A.M.P.S. mentoring program (Culturally Helping And Making Positive Success). C.H.A.M.P.S. is an initiative that aims to bring three "E"s -- "education, empowerment and exposure” -- to young African-American men at the school, providing them with tools they need to excel in life. The video, above, was directed by student Akin Austen and featured rapper Steven Burres, a junior. Burres told The Huffington Post that he relishes the time he spends with his classmates in the program. C.H.A.M.P.S. 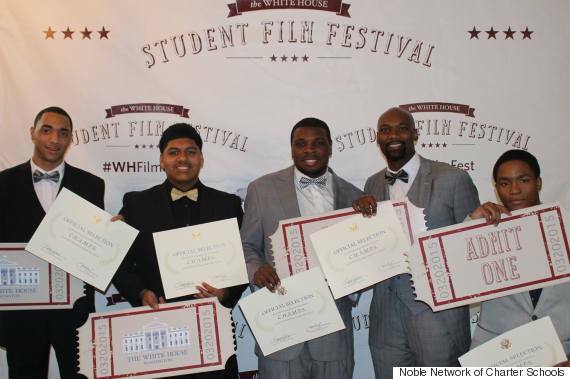 participants at the White House Student Film Festival in Washington, D.C. on March 20. The C.H.A.M.P.S. program, which holds weekly three-hour meetings on Saturday mornings, gives its approximately 100 participants time to work on their studies, check in with their mentors and listen to guest speakers, who are typically African-American men from the community who speak to their experiences of growing up and achieving success. Gary Comer's assistant principal, Vondale Singleton, told HuffPost he originally created a similar program when he was assistant principal at a school in Tulsa, Oklahoma. He noticed young black male students at the Tulsa school were struggling, being removed from class for misbehaving or not completing their work. He decided he wanted to take a more proactive approach and work with them outside of class on strategies to get them on a more positive track. When Singleton, a Chicago native, returned to the city in 2013 and began working at Gary Comer, he noticed many male students were dealing with similar issues. The Greater Grand Crossing neighborhood where the school is based suffers from a high crime rate -- last month, it ranked seventh in violent crime among Chicago’s 77 community areas -- and few economic opportunities. One quarter of the neighborhood's households are below the poverty level. “We’re telling these young men, who at this point in their life haven’t had accomplishments or received awards, that they are born to win in any situation in life,” he said. In addition to their Saturday morning time, the C.H.A.M.P.S. students also go on trips. In the past, they’ve gone ice skating, taken in a White Sox game at U.S. Cellular Field, and even traveled to Milwaukee, Wisconsin -- all financed almost entirely out of pocket by the program’s mentors. Participants and mentors in Gary Comer College Prep's C.H.A.M.P.S. program. Rishard Bournes, a senior who is heading to the University of Wisconsin-Madison in the fall, said the program offers him an opportunity to have real conversation with his peers and drop the “mean mug” expression he says he needs to wear in the city to make sure that “no trouble comes [my] way." Singleton is optimistic for the future of the program and hopes that “every single one” of its participants will graduate from college, then return one day to help mentor and inspire the next generation of youth. He’s also hopeful that similar programs in other troubled communities can follow his example. “If we can make positive success in Chicago, we can make it anywhere,” Bournes added.